Hotel Dewa Retreat is a 4-star property and one of the top 10 luxury hotels in Rishikesh. Dewa Retreat ideally situated on the foothills of the Himalayas in Tapovan area of Rishikesh. Hotel is just 5-10 minute walk from the bank of almighty Ganges and all major temples & ashram near Laxman Jhula. Dewa Retreat brings an array of modern facilities and services to you. Apart from luxury accommodation, Dewa Retreat is the best place for yoga and meditation in Pilgrimage city â€“ Rishikesh. They arranged Yoga & Meditation courses and Ayurvedic therapies along with adventure activities like trekking and rafting. Away from hustle and bustle, the hotel magnificently located on the foothills of The Himalayas near Laxman Jhula (7 Mins Short Walk) Tapovan, Rishikesh - The World Capital of Yoga, a serene & peaceful locale away from the main highway NH-58. All major tourist attractions of the city like Laxman Jhula, Ram Jhula, Tera Manzil Temple and Triveni Ghat etc all are just few minutes drive from Dewa Retreat. The hotel offers one of the best accommodations in the city. Four-storied retreat has 30 contemporary Himalayan mountain facing rooms; all rooms are exclusive designed for true experience of space and luxury. Deluxe Rooms (Partial Mountain View): In this category, rooms are size of 220 sq feet having a partial mountain view with all modern amenities along with 2 single size bed or 1 king size double bed. Super Deluxe Rooms (Clear Mountain and Pool View): Super deluxe rooms are 240 sq feet in size having a panoramic 180-degree view of mountain and hotel’s swimming pool. All rooms are equipped with multiple modern amenities. Deluxe Suite (Clear Two Side Mountain and Pool View): Retreat offers 13 suites in this category; all suites are very spacious and elegantly designed. These suites are approximately 450 sq feet in size having spectacular view of Himalayan Mountains as well as swimming pool. The hotel has an in house multi cuisine organic restaurant named Sattvik. Sattvik offers tasty and delightful cuisines for their guests from all over the globe; they use fresh and organic ingredients in restaurant’s kitchen. - Multi Cuisine Restaurant, Meeting room, Library and Outdoor Lounge, Ayurvedic Spa, Yoga and Meditation studio, Swimming pool. - Free Wi-Fi, Mini bar (non-alcoholic soft beverages), 24 hrs back up, Private balcony, 24-hrs room service, running hot and cold water. - LCD TV, In-room safe, Wooden flooring, Elevator with Handicap Disability Access to all floors and rooms. - One child under the age of 7 years sharing parent’s bed is complimentary. - Child between 7 – 12 yrs with Extra bed INR 1500, Adult Extra Bed - INR 1500. - Check In time is 2 PM and Check Out time is 11 AM. - Any additional taxes levied by the Government shall be charge extra. - The reservations of rooms shall be confirmed only against advance payment. - Please check the availability of rooms with the hotel. 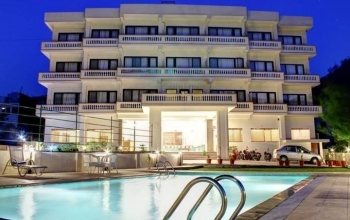 Hotel Dewa Retreat in Rishikesh is just 20 kms from Jolly Grant Airport Dehradun, 6 kms from Rishikesh Railway station, 4 kms from Bus station, 25 kms from Haridwar and Dehradun is 40 kms away.